Trail Blaze is a prequel novella to BOTH the Hot on the Trail series and the Montana Romance series. Darcy Howsam has one last chance to be a respectable woman and to have a secure life: traveling along the Oregon Trail to become a mail-order bride for a miner in California. 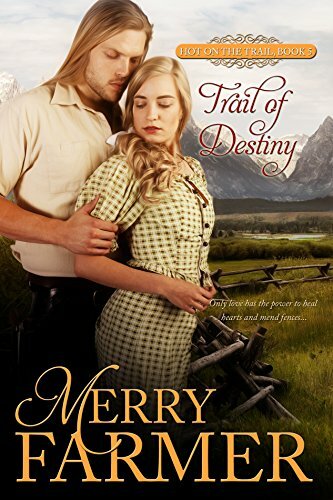 But when the man who paid her way to meet him at Ft. Laramie takes one look at her and rejects her, demanding his money back, Darcy finds herself alone and desperate. Gregory Quinlan has staked his future on moving west and building a life in Oregon. A wife isn’t part of his plan. But when Darcy finds herself in trouble, he steps up to be a friend to her. The two hatch a plan to convince her should-be husband to take her back, only the more they work together, the more Greg falls in love. But what good is love when Darcy belongs to someone else? Against the odds, on an epic pioneer journey, Greg must fight to fix the mistakes he’s made and win back the woman who won his heart with her smile. Emma Sutton fell in love with Dr. Dean Meyers on the very first day of their journey west on the Oregon Trail. Dean is handsome, caring, and noble. If only she could tell him! But between her crippling shyness and the marital machinations of her mother, she despairs of ever being able to say what’s in her heart. When a sudden injury puts her in Dean’s hands, literally and figuratively, she hopes she might just have a chance with him…until a ghost from Dean’s past comes between them. Dean Meyers is determined to make the long journey west to start a new life and leave the horrors of the Civil War behind him. He is charmed by Emma and amused by her mother, and can finally see peace in his future. But when an old colleague shows up to turn his world upside down, it’s all Dean can do to keep love, hope, and Emma from slipping away. All seems lost until Emma finds herself in danger and Dean is given a chance to be a hero…if he can reach her in time. Love will give her courage to find her voice and follow her heart…. Katie Boyle has known Aiden Murphy her whole life. Everyone expects them to marry someday, but as much as she cares for her lifelong friend, Katie wants more from life. She craves adventure and excitement, and doesn’t want to give in to the obvious choice. Heading west along the Oregon Trail is, in her mind, the beginning of the new life she has always wanted, and she intends to embrace it. But when she is abducted by a Cheyenne brave and taken to his village, she is in for more adventure than she bargained for. Sometimes the man of your dreams is the man who has been there all along…. Lucy Haskell has a passion for danger and isn’t afraid to let everyone know it. The Oregon Trail is the perfect way for her to travel home to her father’s ranch in Wyoming, and to meet new friends and talk their ears off along the way. But Lucy’s talking and risk-taking masks a darker fear—that no one could possibly love or even like a woman as unconventional as her. Dr. Gideon Faraday is a scientist: intelligent, handsome, reserved, soft-spoken… and a murderer. He’s heading west to atone for the lives he’s taken, and the last thing he wants is to make friends on the trail or to fall in love. But from the moment he sees bubbly, daring, beautiful, fearless Lucy, he’s smitten. Gideon and Lucy can’t fight the passion that pulls them together—with scandalous consequences—but when a mysterious stranger joins their wagon train and Gideon’s life is in jeopardy, it will take all the daring Lucy possesses to keep Gideon alive. She never should have married him. Charlie Garrett thought he could escape the crimes of his past and start a new life out West. He never intended to marry, but when clever school teacher, Olivia, loses her bet, he loses his heart. When a ghost from his past show up on the trail, intent on revenge, Charlie must become more than the charming rake in order to save Olivia and the surprising love growing between them. Pete Evans has finally completed his last journey as trail boss on the Oregon Trail, leading his newfound friends all the way across the frontier to Oregon City. But his heart grows heavy as he realizes this means the end of his time with Miss Josephine Lewis and the orphaned Chance family. Sense and logic tell him he should collect his belongings and retire, like a man his age should, but something keeps drawing him back to Josephine. Josephine Lewis has a whole life waiting for her with her niece in Denver City…so why does she find it impossible to cut ties and head where reason dictates she should go? She is certain she’s too old, at age forty, to form any new attachments, especially romantic ones. And how could a single woman of her age possibly be expected to become a mother to four orphans? Her final responsibility before moving on is to find a home for the Chance children. The first three books of the popular Hot on the Trail series are together here for the first time, along with an all-new short story, A Haskell Christmas Reunion! Each book is a stand-alone that can be read without having read the others. Books 4 – 6 of the popular Hot on the Trail series are together here for the first time! Gather up your mail-order brides and cowboys and come out to the old west to fall in love on the Oregon Trail… Each book is a stand-alone that can be read without having read the others. Books 7 – 9 of the popular Hot on the Trail series are here to complete your collection! 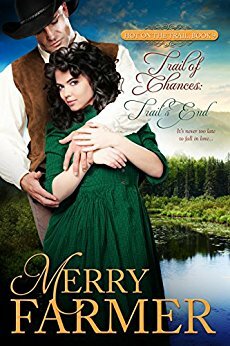 Journey to the end of the Oregon Trail…an adventure that is just the beginning of a world of frontier romance! Each book is a stand-alone that can be read without having read the others.